Congratulations to Belfast-based game development studio Italic Pig, which has won a top-prize at this year’s inaugural Big Indie Awards in Shenzhen, China for its project Mona Lisa. The awards ceremony provides an opportunity for indie developers to achieve global recognition as well as cash and promotional prizes of up to $25K. 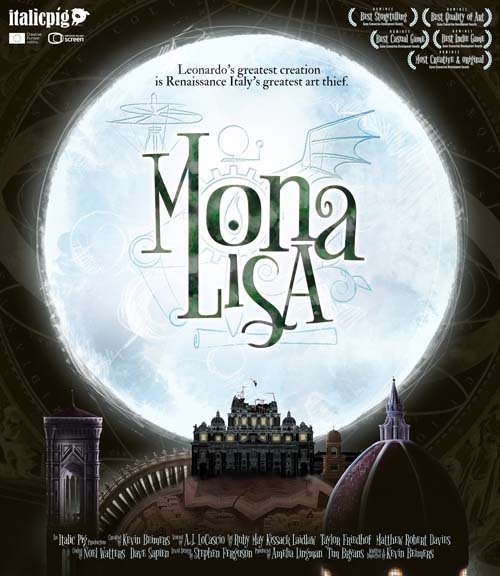 Mona Lisa is a stealth and forgery adventure that sees Leonardo Da Vinci’s famous creation brought to life as Renaissance Italy’s greatest art thief. The project received funding from Northern Ireland Screen with support from Invest NI. Kevin Beimers, Writer and Director at Italic Pig, travelled to Shenzhen to accept the award last week. The history of Kevin’s win began earlier this year when he won the Very Big Indie Pitch in London at the PocketGamer Connects conference in January 2017. From there, Kevin was invited to submit Mona Lisa to the Big Indie Awards in China. The selection process was worldwide with over 300 indie companies submitting entries. From the selection process, three companies were invited to China to present their games and provide a final pitch to the judges, with Mona Lisa coming out on top. Kevin said of the process, “We are thrilled to have won at the Big Indie Pitch Awards for Mona Lisa and to be recognised for all our hard work over the past number of years. This project has been a real team effort from everyone at Italic Pig and I am so proud of the end result. “It was also a fantastic experience to travel to China and represent the Northern Ireland gaming industry to a global audience. While the industry in Northern Ireland may be considered relatively young, there is no denying the abundance of talent that we have available here.